Heska Lab Integration / Interfaces comprises of a Windows PC with the Heska DCU (Data Caputure Utility) installed on it. Alternatively, the Heska View software (which provides more user interface to view lab results, etc.) can be setup to also handle the export of results out to XML. 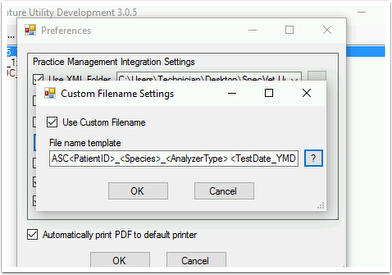 The basic process is that the analyzers send the results to the DCU which receives the data, and then converts it to XML, and stores it in a specified folder. 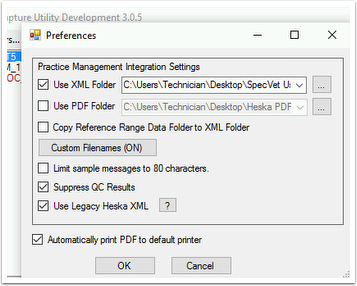 When setting up the DCU software, under preferences, be sure to select "Use Legacy Heska XML"
Also ensure that there is a Custom Filename setup with (typically the clinic abbreviation) something static as the first part of the file name, so that we will not get "spaces" in as the first character of the filename. Once the files are saved to the XML Folder on the Lab PC... we need to setup our FTP Server - FileZilla - to use that as a home directory, so that the SpecVet database server can connect there, grab the Result XML Files, and delete them as well. Are there result XML files in the XML Directory? If so, are there any with spaces in the file names, which may prove to be problematic via FTP. Is the Heska DCU utility talking to the analyzers? Suggest QUIT and then restart the Heska software. Are we utilizing Legacy Heska XML? Other than that, the Heska intergration is pretty simplistic and foolproof.